Cytokeratin 16 protein is a member of the keratin (type I) family. The keratins are intermediate filament proteins responsible for the structural integrity of epithelial cells and are subdivided into cytokeratins and hair keratins. Epidermis-specific type I keratin that plays a key role in skin; acts as a regulator of innate immunity in response to skin barrier breach; required for some inflammatory checkpoint for the skin barrier maintenance. This keratin has been coexpressed with keratin 14 in a number of epithelial tissues; including esophagus; tongue and hair follicles. 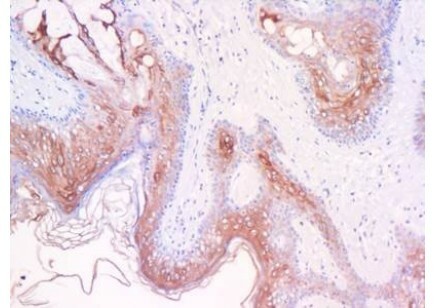 Cytokeratin 16 is expressed in benign stratified squamous epithelium and squamous cell carcinoma of the head and neck; as well as luminal cells of mammary gland and sweat ducts. It is absent in non-invasive breast carcinomas and normal breast tissue.